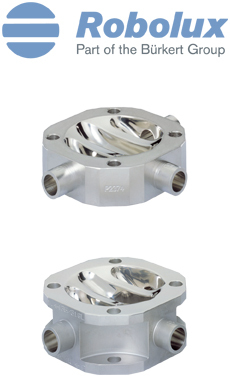 Diaphragm valves that make a big difference! Diaphragm valves are not normally a major consideration, but Burkert’s RoboValves will change your mind. Designing your process with RoboValves will improve your performance in down-stream processes, such as filtration or chromatography and in many other situations where you are handling valuable products. Burkert’s RoboValve will save process time and minimize the number of valves and diaphragms, thus reducing costs. The secret is NO hold-up volumes!!! This is achieved by allowing two valves, independently actuated, mounted under a single diaphragm, saving space and eliminating T-pieces. Innovation is rarely this radical, design rarely makes such a difference.